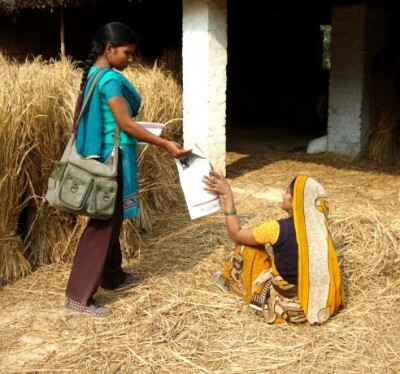 How do you make the voices of women in poor, rural areas of India heard? A hard-hitting community newspaper is a good place to start. 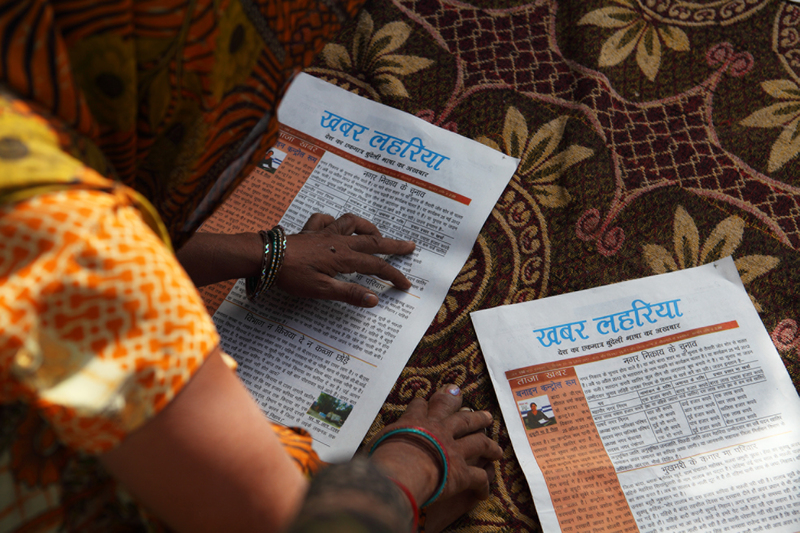 Khabar Lahariya is a women-run rural weekly newspaper produced in the local languages Awadhi, Bajjika, Bhojuri, and Bundeli in the Indian states of Utter Pradesh and Bihar. The paper is distributed to 80,000 readers across 600 villages. It describes itself as a “local watchdog” and a “weapon of the weak,” reporting on injustices and corruption affecting rural communities that don't normally receive media attention. Launched in 2002, Khabar Laharia became available online in February 2013. To learn more about their story, we spoke with Poorvi Bhargava, Khabar Laharia's editorial coordinator. Rising Voices (RV): Why did you choose the name Khabar Lahariya, which means “News Waves” in English? RV: Is the team made up of volunteers? PB: No, no. All of these women are full-time employees with Khabar Lahariya. For many of them, this became a source of income which they could use on their own terms, or an additional source of income which helped them improve the standard of living for themselves and their families. RV: Do you have any men in your team? RV: How many of you run the project? PB: It started out as a space that women had made for themselves, and so it has stayed that way. It all happened in a context where determining spaces and dynamics for themselves was very important for women. And yes, 40 women spread over 2 states, all of them rural, mostly from marginalized communities. RV: Some of the participants barely knew how to write and read initially, and they are now professional reporters. Was it a difficult process? RV: Do you have a particular style for your readers, who are also coming from rural provinces with perhaps low literacy? How have you reached out to them? PB: The style of Khabar Lahariya is not difficult, but is different. Each of the six editions comes out in the local language of the area (some people call them “dialects” but we prefer to stick with “languages”). Many of these languages aren't used to produce written material anymore, so [the language printed in the newspapers] is something that the indigenous people of that area speak and are familiar with, something the reporters speak in all the time, and it preserves languages that would otherwise fade away. Since the language is easy and the newspaper is designed differently from mainstream newspapers (bigger fonts, easy words, conceptual definitions for complex issues), it makes it a good read for rural poor populations who might not have gone to school for very long. RV: Can you tell us a bit about your move to publish online last year? How was it made possible? PB: In 2012 we got a grant from the United Nations Democratic Fund for two years. This was also the period when Khabar Lahariya expanded from three [linguistic] editions to six. A website, and putting Khabar Lahariya's content [online] was part of the activities that UNDEF funded. We were also very keen on making an online presence in this day and age when we see many people (specially the youth) accessing the Internet on their phones, even in the villages where we work. We also wanted the reporters to have ownership of the online edition as much as they have of the print edition, so we started trainings with a group of the reporters on understanding the Internet beyond just email and Google […] Currently we're trying to build a readership for the website (both rural and in the outside world). For the first time these languages (Bundeli, Awadhi) have found space on the Internet and English translations have put the areas we work in and their issues out there, for everyone to read. 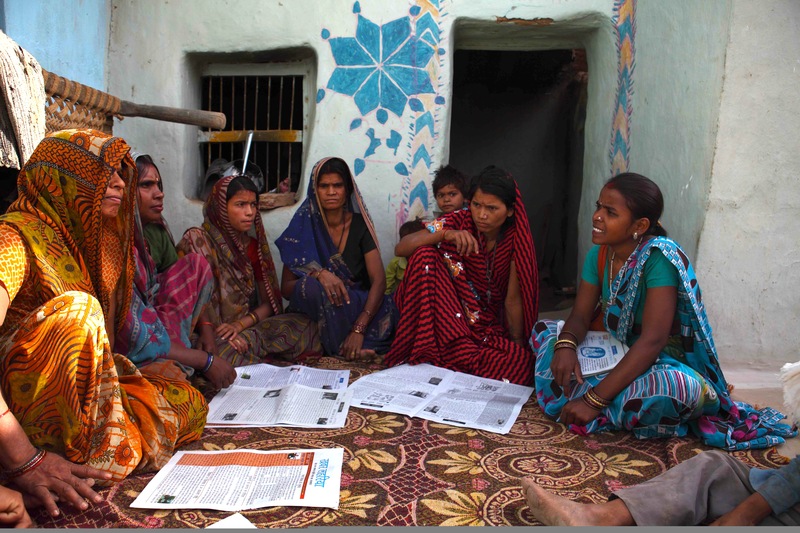 RV: In a few words, what can you say about technology and women empowerment in the context of Khabar Lahariya? PB: In many ways, technology is one other thing (much like public spaces) to which access has been limited for women. If journalism was a non-stereotypical profession to bring women into, so is access to technology. Technology has become an important instrument for accessing information, which in turn has a direct impact on knowledge and in claiming rights. As a result, technology in the hands of women is for us directly related to their empowerment. Even in Khabar Laharia's context, we have seen how at first, in the initial years, it was a challenge to bring women into the public sphere as journalists, where women were asking the questions and demanding answers. The Internet today […] is another such public sphere which needs to be populated with women's voices. That is what Khabar Lahariya is trying to do – putting the information out there and helping more and more women access it. You can follow Khabar Lahariya's latest news online, and stay up to date with their work on Facebook and Twitter @KabarLahariya. All images are published with Khabar Laharia's permission. its really heartening to know that women from villages can do it.